Trump, aka swamp rat, has been fighting an uphill battle to keep the swamp in Washington DC well-stocked since the first month of his Russia/Saudi,UAE assisted theft of the presidency. Here's a list of 30 White House staff and cabinet members who were appointed by Trump, who are gone now. 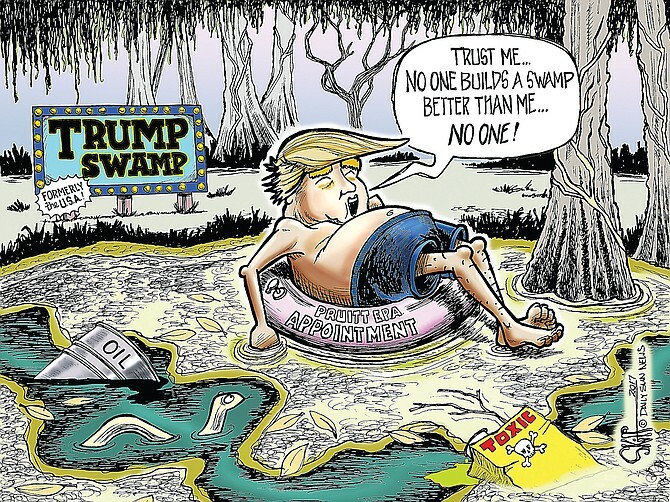 To Trump's dumb surprise, it's harder to keep the swamp full than he thought. Nearly every one of the 30 people listed above, were involved in scandals to some degree. Several of his current appointees, Scott Pruitt, Ben Carson, and Betsy DeVos, are being investigated for a range of reasons running from ethics violations to ripping off taxpayers with over-the-top indulgences.